MOTIVA helps laboratories and other conformity assessment bodies more easily implement their own quality systems. MOTIVA uses internationally-recognized experts in laboratory quality systems, including one of the authors of ISO/IEC 17025. See MOTIVA pages on LinkedIn. See our About Us page. know international recognition of accreditation. Read the feedback from all previous participants by clicking on this Training Feedback link. All ILAC-recognised accreditation bodies provide comprehensive training to their accredited organizations. 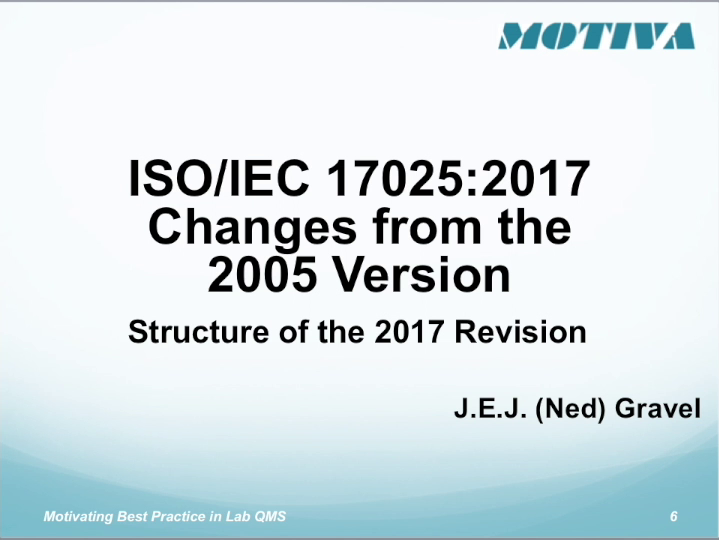 MOTIVA is now delivering online training on the changes to 17025 caused by the most recent revision. See our Online Training Page here. See our Course Description Here. MOTIVA is now delivering training on the revised version of 17025. First deliveries will be in Myanmar. Read the results of our early deliveries from what actual participants think. Our course structure is very likely to be modified from this participant feedback. See the Training Course Page here. Download the Course Syllabus here. Why Building National Conformity Assessment Infrastructure in Developing Nations is Important to us. I do not normally tend to write articles on this work, but I think that the people taking the risk of building their own nation's capacity to help protect the health, welfare and safety of their citizens deserve the recognition for the risks they take. The work in Myanmar has finally reached a healthy stage of implementation. I am able to observe success in an organisation that will be dedicated to helping regulators protect the health, welfare and safety of the citizens of the Republic of the Union of Myanmar. Watching the success in the eyeballs of the people from the labs, the staff of the accreditation body and the stakeholders who recognize a national need for accreditation is very heady stuff for me. It makes long international flights and absences from home more endurable. Watching this success is worthwhile to me. What does it take to Build a Quality System? MOTIVA announces the publication of a document that takes an organisation through a self examination of its need and readiness for a Quality Management System (QMS) and leads it through the most appropriate steps in the design and implementation of a QMS conformant to one of the ISO/CASCO standards such as for laboratories, inspection bodies, and product certification bodies. This work includes the set of steps from determining the need for a QMS right through to applying for accreditation from an ILAC signatory body. Download it here and determine where your CAB is now. Determine how long it will take and what effort your CAB will have to undertake to put a conformant QMS in place. This document does not promote any consulting services, but it does shed strong light on what it takes to succeed in this effort. As MOTIVA staff can attest, it can be a long and lonely journey - but it need not be. 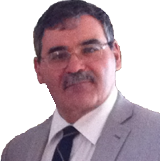 Has ISO/IEC 17025 Improved the Quality of Lab Data? We did not write 17025 as an accreditation standard. We wrote it as a laboratory QA/QC standard against which labs could establish their own competence. Accreditation against ISO/IEC 17025 is a large, but secondary outcome of that effort. Although implementation of 17025 may not have the same impact on the advancement of science that pure R&D does, it has, over the last 14 years, established a consistency of measurement that has allowed laboratories to improve the consistency and validity of their measurements and this has assisted in the advancement of measurement techniques - therefore advancement of science. From the June 2017 Edition of Accreditation and Quality Assurance. So you want to be an Assessor? This little video, created by longtime assessor, Mr. Greg Gogates, provides a good example of some of the absolute worst reasons to become an assessor. See http://www.youtube.com/watch?v=zcYCDswjIEM&feature=youtu.be. Good assessors will base their words and their actions only on fact verifiable by evidence. Good assesors do not have opinions. And good assessors (while they may have opinions because they can be passionate about their science) should not have such high opinions of themselves, and their own opinions. On the other hand, enjoy another short video being used by the Standards Council of Canada, an ILAC-signatory accreditation body, to recruit assessors. It shows the best reasons why we should want to become an assessor. See the video here. 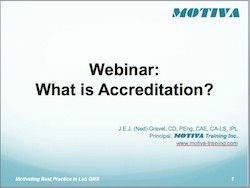 Recently, MOTIVA staff participated in a discussion on LinkedIn about how to select an accreditation body to meet the needs of the laboratory staff member asking the question. See the discussion by clicking on this link. Besides the obvious criterion (does this AB accredit for my scope?) there may be some other issues to consider. Accreditation is only formal recognition of the laboratory's demonstrated competence and if we were to order the things that were important to the lab in terms of demonstrating technical competence, that might focus the questions to the prospective ABs during discussions with them. Remember that the AB works for lab (EU Directive in Europe notwithstanding). They are a service provider to the lab.